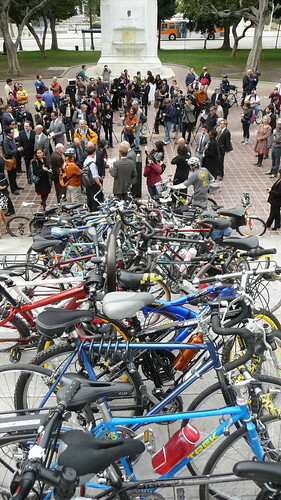 This morning, a gathering of City staff, elected officials, and the bike community came together to celebrate the new bike plan and reflect on what its adoption means for the City of Los Angeles. 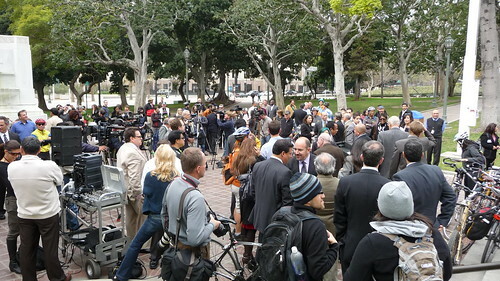 Well over 100 people turned out for a celebratory press conference on the steps of City Hall this morning at 9:30 AM. In the crowd were members of LACBC, Bikeside, C.I.C.L.E., Midnight Riddaz, the BAC, and many others. First to the microphone was Mayor Villaraigosa. The Mayor started out by profusely thanking the bicycle advocacy community for the part they played in seeing this plan to completion. He joked that while he had become much more dedicated to the cause of bicyclists following his crash last spring, it was the long-term efforts of the bicycling community which he tapped into to help move the cause of bicyclists forward in Los Angeles. Villaraigosa also credited the various City departments who have helped improve conditions for bicyclists, including City Planning, LAPD (especially Chief Beck), and LADOT. The Mayor, when comparing the new bike plan to plans past, pointed out that the yearly mileage of bicycle infrastructure constructed under the new plan will increase fourfold. The City will also be petitioning Metro in the months ahead to triple their allocated funding towards bicycle projects. Villaraigosa was also eager to bestow his deep thanks to Alex Baum, President Emeritus of the Bicycle Advisory Committee who had served as its chairman for over 30 years. Kudos to Alex Baum for his decades of dedicated service was a recurrent theme throughout the day. Each of the City Council Members who spoke at today’s press conference have been great supporters of bicyclists and defenders of bicyclists’ rights on the road. Each Council Member also had their own take on bicycling issues and what the bike plan means moving forward. Council Member Ed Reyes lauded the vision of the plan and the continuing culture change taking place both in Los Angeles and in City government. He said he eagerly anticipates implementing bike lanes and road diets across the City to help improve the safety, health, and economic vitality of our neighborhoods. Council Member Bill Rosendahl lauded the efforts of Bikeside’s Alex Thompson and stressed the importance of an Anti-Harassment Ordinance for bicyclists. Council Member Tom LaBonge put the political roots of the bicycle movement in historical context, going back to Mayor Richard Riordan. He also envisioned a City where you would be able to safely experience by bicycle all that Los Angeles has to offer. 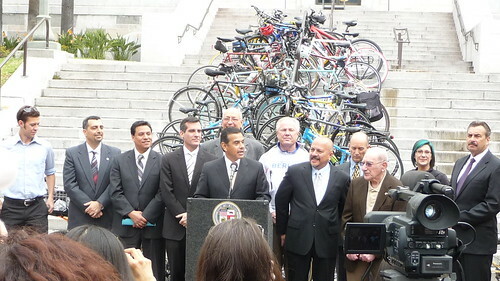 Council Member Jose Huizar stressed that we should always strive to do better, and pointed out the recent success of installing LA’s first bike corral in his district. City Controller Wendy Gruel related her struggles to improve conditions for bicyclists when she sat on the Transportation Committee and celebrated the freedom that bicycles can give to people. 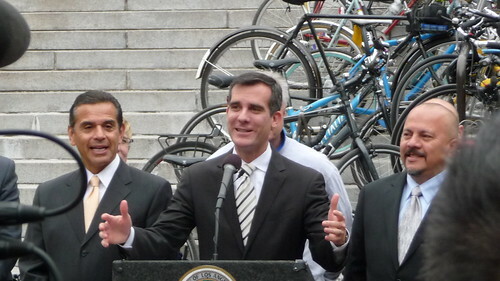 Council Member Eric Garcetti dubbed today “a bike love-in”, and extolled the positive effects of events like cicLAvia. He also stressed that this plan was as much about safety and education as it is about bike lanes. The plan, to him, represented a re-imagining of the City. Next up, a few representatives of the bicycle community spoke up about the plan and their work with the City to make the plan a reality. The LACBC’s Jenn Klausner spoke first, urging everyone assembled to enjoy the day and to revel in what they had collectively accomplished. While pointing out that conditions can always be better for bicyclists, she identified the new Bike Plan as a strong road map for how to get there. She also reinforced the truth that improving conditions for bicyclists can create improvements for all. It creates safer streets from drivers, bicyclists, and pedestrians alike; it helps relieve congestion and pollution; it improves public health; and it economically revitalizes our commercial districts. The newly elected Chair of the BAC, Jay Slater, spoke next. First off, he lauded the decades of selfless service provided by BAC President Emeritus Alex Baum. He then stressed the role of the BAC as the link between the City, the Neighborhood Councils, and the community in getting new bike projects installed across the City. 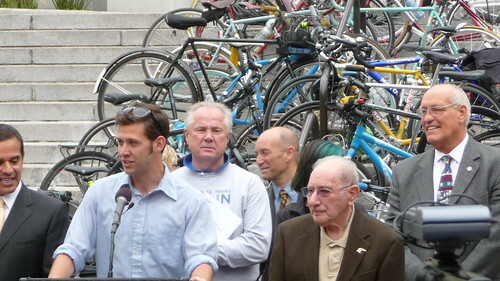 Bikeside’s Alex Thompson spoke last, playfully reproaching City officials for giving him his first gray hairs. He gave special thanks to City Planning’s Claire Bowen for bringing everyone to the table and forging difficult compromises on which everyone could agree. Calling Los Angeles “the envy of the nation” for the scope of its new bike plan, he called on City staff to “think outside the bike lane” when implementing projects to achieve the highest standards in the country. Since your celebratory hangover must be subsiding by now, the question raises itself: What’s next? The truth of the matter is that, despite a 2+ year process, getting the Bike Plan written and adopted was the easy part. Now it’s our collective responsibility to see implementation through to the very last bike lane. How can you help? You can attend public meetings like the BAC or the BPIT to make your voice heard. You can attend great bike events like Bike to Work Week and cicLAvia (as a side note, GOOD Magazine is hosting a fundraiser for cicLAvia this weekend, with 25% off tickets until midnight tonight). You can contact your Neighborhood Council or your City Council Member to let them know you support implementing the Bike Plan where you live. 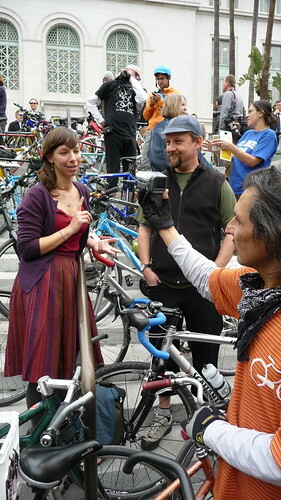 You can join a bicycle advocacy organization like the LACBC, Bikeside or C.I.C.L.E. to swell their ranks and grow the political authority of those pushing for change. 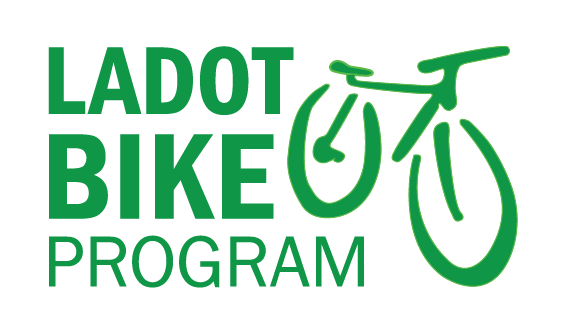 And, at the very least, you can keep reading LADOT Bike Blog, where we’ll do our best to keep you up to date on what’s happening at the LADOT Bike Program. Congrats, everyone. Let’s take a deep breath and get back to work. As the new Bike Plan shows, we’ve got plenty to do.